Captain, Conor Coady has proved a huge figure in Nuno Espirito Santo's defensive three since his arrival as manager. His move from midfield proved a revelation as Wolves kept 24 Championship clean sheets on their way to the league title in 2017/18. The Liverpudlian’s influence on the Wolves side has grown each season he’s spent at Molineux and he was rewarded with a fresh contract in September 2017. 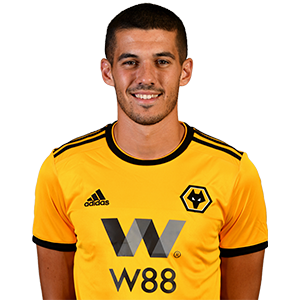 Coady spent much of the 2017/18 campaign donning the captain’s armband and missed just one Championship fixture. Coady joined Liverpool’s Academy as a 12-year-old, went on to captain the Under-21 side and made two senior appearances against Anzhi Makhachkala and Fulham. While at Anfield, the youngster received international recognition by England all the way up to the Under-20s side. However, a season-long loan at Sheffield United wetted Coady’s appetite for regular football and that’s what he got when signing for Huddersfield on a permanent basis. The 24-year-old spent just 12 months in West Yorkshire, before moving to Molineux, where he was played regularly since.